Blood Money Looking fruitier than Mr. Thunderstick, the drummer of N.W.O.B.H.M. headwrap mask thingy is the metal and spikes-clad Blood Money from Great Britain. Bleeding” 1986 LP, and “Battlescarred” 1987 LP. The difference between Blood Money and Spinal Tap, though, is that nobody was laughing. Blood Money seem like they just formed so they could get some loose, crack or heroin addicted females over to the band’s rehearsal pad. there is a bloody chainsaw drawn up in pretty stupid fashion. Blood Money play boneheaded, nonsense Heavy Metal. The darn guitar solos will make you reach for the aspirin bottle. to form a death/doom Metal project called Xanthoma. Yuck. 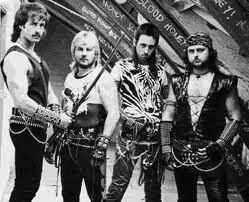 Note:Blood Money also have the distinction of Worst Heavy Metal song title ever invented “Taras Bulba”. ‘Nuff said.